This is the website of Malcolm Devlin, who sometimes writes vaguely strange stories of one sort or another. This collection is published by Unsung Stories, and is available to order now via the link below or through your favourite bookshop. It contains ten stories, each a strange sort of coming of age tale. There are ghost stories without any ghosts in them, werewolf stories without any werewolves in them, a city that turns into forest, a barren planet with a peculiar sort of harvest celebration and a suburban street suffering a very personal and rather embarrassing apocalypse. I hope you enjoy them. While you're at it, you can also sign up to the Unsung Stories mailing list and you'll get new stories from smart and talented folk sent to you for free. 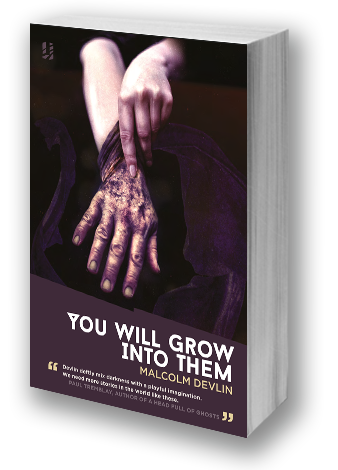 You Will Grow Into Them has been shortlisted for the 2018 British Fantasy Awards and the 2018 Saboteur Awards in the category of 'Best Collection'. “ Whilst reading this collection I was blown away by the quality of the writing and by how much each story got under my skin. They are subtle, empathetic, yet eerily strange; disquieting in places with the accuracy of the human condition portrayed through a darkly playful lens. If you'd like to get in touch, you can email me at malcolmvdevlin@gmail.com. Alternatively if you'd prefer, you can hunt me down on Twitter, where I intermittently post things that are a little bit trivial and occasionally resort to mild sarcasm.